Excellently finished properties in a quiet yet central area of Keswick near to the River Greta. Being so central it is easy to walk to the lake, parks, shops and fells with the local bus service just minutes walk away meaning you can enjoy a car free holiday. Greta Bank - ground floor, riverside apartment with patio area looking up to the local fells, 2 bedrooms and 2 bathrooms. Greta Bank has full central heating, double-glazing, allocated car parking space and a closed circuit security system at the entrance. Free unlimited WiFi internet access is available. The kitchen is fully fitted and very well equipped with ceramic hobs, integrated microwave, electric oven, full size fridge/freezer, washer/dryer, microwave, dishwasher etc. There are two very comfortable bedrooms, one double room with a super king sized bed, with an ensuite shower room with shower, WC and wash hand basin and one twin bedroom with two extra long single beds. Both rooms have fitted bedroom furniture: wardrobe and handy desk/drawer units with vanity stools. All beds have comfortable double layer mattresses. The double bedroom also has a rattan chair. The master bathroom is with WC, wash hand basin, bath with power shower over. One bath towel and one hand towel per person are provided. The lounge has two settees, dining table and four chairs, TV, DVD and CD players. The fireplace has an electirc coal effect fire. There are French windows open onto a small patio area where there is a wooden table and four chairs, potted plants and fabulous views across the riverbank towards the fells beyond. Quaver Cottage and Elm Cottage - 2 cottages and both accept pets by arrangement. Quaver Cottage - The lounge is very private and has French doors looking out over the rear garden area. There is a TV, DVD & Compact stereo with DAB radio, CD player and Ipod docking station, very comfortable suite, fire with beech surround, oakdining table and four chairs. A garden table and some chairs are stored under the stairs. The kitchen has fully fitted units, electric fan oven & gas hob, fridge /freezer, dishwasher, microwave, washer/dryer DAB radio etc. 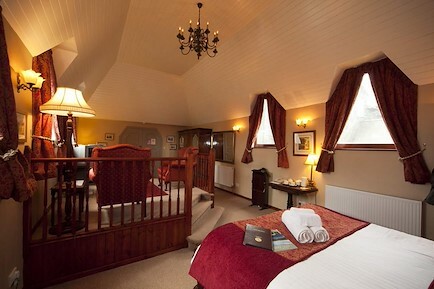 There are two bedrooms, The king-size room has a solid oak king-size bed, oak bed side tables and wardrobe. This room looks out directly over the River Greta and towards the fells. The twin room has two solid oak single beds, built in wardrobe and oak drawers. Both bedrooms have co-ordinating bedding and curtains. The bathroom has a modern white suite. Bath with shower over,WC, wash basin and shaver point. This quiet, comfortable cottage is only two minutes walk from the town centre yet backs onto the river Greta and overlooks fields towards Portinscale and the fells beyond. Quaver Cottage is in a very quiet location and is ideal for those wishing to get away from the noise of town whilst still being very close to the centre. Elm Cottage - This modern, two bedroom detached cottage is recently refurbished and offers very central accommodation in a quiet, convenient area of the town and there is private parking next to the cottage. Ideally placed for very easy access to both the town centre and Derwentwater. Within minutes you can walk to Hope Park, Keswick theatre, Keswick launch, the cinema, bus station, supermarkets and town centre with all its shops, bars, restaurants and cafes. A lovely cottage in a great location. As you enter the cottage, the hallway is light and well decorated and leads to the good sized kitchen and lounge. The lounge has a window and French doors overlooking the garden area (table and chairs are provided) making this a very light room. There are two settees, oak dining table & four chairs, TV, and CD player and plenty of lamps. The kitchen is again a good light room and has plenty cupboard and worktop space. There is a fridge/freezer, gas cooker, washer/dryer, dishwasher, microwave etc. Upstairs there are two pretty bedrooms, one large twin room and a smaller double room. The twin room is very spacious and has two single beds (which can be made up as a super-king for a small charge), wardrobe drawers bed-side cabinets. The double room is cosy and has a double bed, wardrobe drawers and coordinating bed linen and curtains. The bathroom has bath with shower over, w.c. and wash hand basin again a very light room painted in cool blues. Being only about 15 yards away from Quaver Cottage may prove ideal for two families wishing to holiday together but not wanting to be in the same house. Coledale - 1st floor apartment with fabulous views to the fells. This apartment is ideal for people wishing to be close to the town centre whilst still being somewhere quiet. It is a lovely, warm, bright apartment with full gas central heating and constant hot water. The large lounge has two very comfortable settees and an easy chair, TV, CD player, an electric fire with a modern surround, coffee table, sideboard, dining table and four chairs. The kitchen is well planned and equipped. There is plenty of cupboard space, electric oven and ceramic hob, dishwasher, washer/dryer, microwave, toaster and plenty of work space. The main bedroom has a double bed, two built in wardrobes bedside tables and an en-suite with shower, WC and wash basin. Bedroom two has two single beds, bed side cabinet, built in wardrobe and large chest of drawers. The bathroom has a white bathroom suite with a shower over the bath and is very tastefully finished. Maiden Moor - This recently refurbished ground floor two bedroom apartment has been beautifully decorated throughout with modern and luxurious fittings to offer the highest standard of accommodation. This apartment is set in a fabulous peaceful location where you will feel like you are on the edge of town, yet in reality are within minutes of the market square. Suitable for arrival by public transport being just a short distance from the bus station & taxi rank. Allocated parking for two cars & complimentary superfast broadband. All properties have central heating, private car parking and sleep between 2 and 4 persons.. Your enquiry will be sent directly to Elliott Park Cottages & Apartments. Please fill in as much detail as you can.